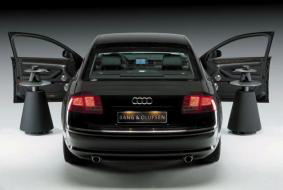 Audi s A8 and S8 are going to be outfitted with a sound system incorporated by Denmark s Bang & Olufsen. This is not your standard luxury car stereo. For starters, it costs $11,000. For that kind of money you get 14 speakers strategically positioned throughout the cabin and two sets of amplifiers each pumping out 1,000 watts of sonic ecstasy. In order to prevent sound quality loss, the system uses the Danish company s Acoustic Lens Technology, which enables high frequency, minimal distortion playback. The sound system takes into account all types of travel conditions, such as driving at high speeds and wind noise.